So how do you keep yourself busy on a Thursday afternoon off-day. How about unveiling your Winter Classic Jerseys. The Pens held a little exposition Thursday showcasing their new design for the jerseys that they will wear for the Winter Classic this year and possibly as alternates afterwards. Let's see the pics. Not bad. From what I saw, the response to these was generally negative. I like the idea. The color scheme is nice, and I totally dig the retro logo. The only grievance I have is the pinstripes. Why so many? Are they really necessary? Otherwise, they're decent. Let's have a closer look at the best part. The retro logo looks sweet with this layout. Our friends Geno and Staalsy (who is getting mighty close to a return) were on the scene to help showcase the new jerseys. "In Soviet Russia, jersey wear you." 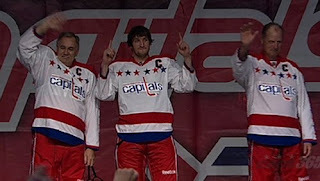 Personally, I thought the old thirds were better, but it could be worse. We could be stuck wearing these. 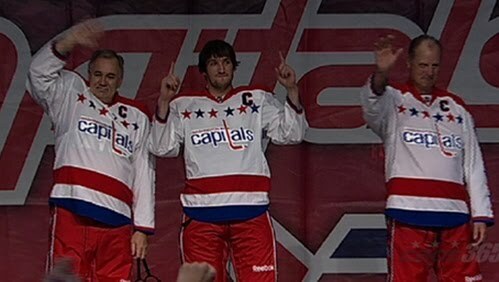 No offense to the Caps or their hideous jerseys. But it doesn't matter who has the best jerseys, but rather who wears them better. But I'm getting way ahead of myself, the Winter Classic is months away. Big game vs the Flyers tomorrow.